Advocates for a sensible design for Forest Hill Road are, shall we say, less than pleased with Rep. Allen Peake, and Sen. Staton is also in a bit of hot water. For those of you who do not live in Macon, there is a controversial plan in place to expand Forest Hill Road, a winding, shaded road through a residential neighborhood in North Macon. Lee Martin says that Peake offered to set up a meeting with GaDOT officials to communicate the concerns of the neighborhood group. Instead, he invited two of the commissioners (Bishop and Richardson) who support the current plan to come to the meeting and invited exactly no one representing the other side of the argument. Forest Hill neighbors are none too happy, and I'm wondering which of the neighbors may now have their eye on Peake's seat. Three weeks ago, as did many of you, I attended Charlie Bishop’s “listening” forum at the Museum of Arts and Sciences, (http://www.macon-bibb.com/FHR/FHR_Meeting20070910.htm)and I sat behind State Representative Allen Peake, who represents District 137 which includes FHR. I had all I could take of County Commission Chair Charlie Bishop's lack of knowledge and misrepresentations about the FHR project. I started to leave and Rep. Peake stopped me with a request to “please don’t leave yet, I have something to say and I want you to hear it.” He went on to publicly state that he and Senator Cecil Staton were going to Atlanta the next Monday to visit Harold Linnenkohl and “take the concerns of the FHR neighborhood to GaDOT.” In a conversation after the meeting, in four or five e-mail conversations, and one phone conversation before the trip, he mentioned over and over that he and Senator Staton were going and also that Larry Walker, the Georgia State Transportation board member for our district was going and would meet them there. He indicated that he planned to ask DOT to put the project on hold for five years until the city and county could study the impact of new demographics occurring within the county and he said he would ask for the moratorium and “only intersection improvements and resurfacing.” All of these requests were agreeable to the neighborhood and residents. In fairness, he said, “He could make no promises”, but he didn’t indicate he was taking all the "opposition"!! From conversations with someone whom I know that is intimately connected with GaDOT, from written records that we have obtained under an Open Records Request from GaDOT, and by extrapolating from information that we have not been able to obtain because there were no minutes taken at the meeting, either by written record, or audio, and by information that was received, but portions “blacked out” (see attached) we can only deduce that because of the people “invited” and present at the meeting, and the lack of a written record, Rep. Peake never intended to “take the concerns of the neighborhood” to GaDOT, and in fact, misrepresented to me personally, and to others, his intentions to do so. 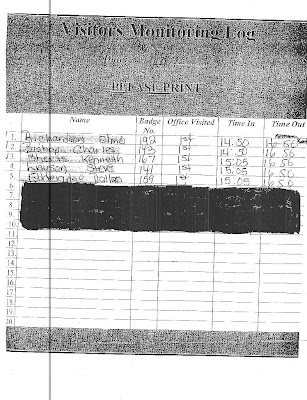 From what is shown in the “blacked out” document received from GaDOT, these people were present at the meeting and “signed in”: Charlie Bishop, County Commission Chairman; Elmo Richardson, County Commissioner who represents the FHR county district; Ken Sheets, the county engineer, Dallas “Van” Etheridge, Moreland-Altobelli (I’ve never known him to be called anything but Van! ), and Steve Layson, the county’s Chief Administration Officer. The other names were “blacked out”, but one would have to assume that Rep. Peake and Rep. Staton were there!! Wouldn’t one.......? Charlie Bishop said at the county commissioners’ meeting the night after the Atlanta meeting that County Commission District II representative and County Vice-Chairman, Bert Bivins, was also present. I think that begs an important question as to why no one from the FHR neighborhood was invited to go, or why Commisioner Joe Allen, the remaining county commissioner and a supporter of a rational design for FHR was not invited, and more importantly, why no one from the city was invited? My reliable DOT source, who although not present at the meeting, said the scuttlebutt around the agency, was that the delegation from Macon emphatically asked Commissioner Linnekohl to continue with the project as proposed. I will not tell you how to feel about Rep. Allen Peake’s or Senator Cecil Staton’s actions, but I will tell you it has been a long time since I have felt so mislead and misrepresented. To have invited all the avowed "opposition" and none of the supporters for a reasonable solution to the FHR dilemma is just unconscionable. Attached is a copy of the “blacked out” sign in sheet. Incredible, is it not? I only have the power of one vote, but I can assure you, Rep. Peake and Senator Staton, who represent my district, will not get my vote. Again, in all fairness, I never spoke to Senator Staton, but I can’t believe in my wildest imagination that he wasn’t complicit in this whole sorry duplicitous arrangement. One can only wonder what their motive really was. Certainly it was not their publicly stated one. I will pray for these two politicians. I have not been keeping up with this but am curious to know who stands to gain $$ from it. 3 Segments: Alice Boyd, Susan Hanberry-Martin, Elmo Richardson & Steve Layson on the Randall Savage Show.